The Cadillac Culinary Challenge I attended took place on a beautiful, hot, Southern California day in the Irvine Spectrum Center courtyard next to the ferris wheel in a black open-sided tent. Inside there was a stage in front with two cooking counters for the two challengers, celebrity Chef Mary Sue Milliken of Border Grill in Los Angeles, and local Chef Yvon Goetz of The Winery Restaurant in Tustin, CA. There were about 100 seats in the audience for all the people who were test driving the new Cadillacs and attending the Culinary Challenge. 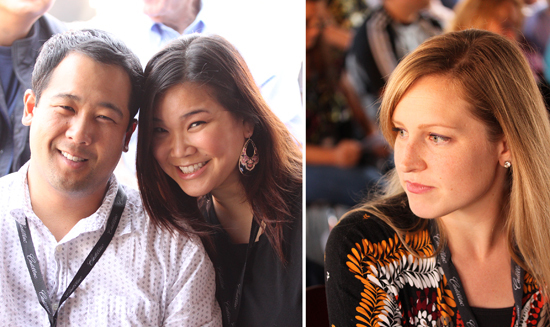 This event was also sponsored by Epicurious, Bon Appetit, Share Our Strength and TasteBook. And I got to be one of the judges and sit in the front row. I had no idea what to expect. 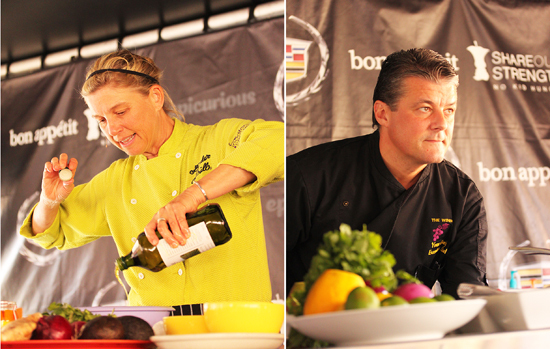 Sustainable seafood was the common ingredient in both chefs’ dishes. Chef Mary Sue chose Wild Alaska Halibut and Chef Goetz used Mahi Mahi. Chef Mary Sue talked at length about her concern with sustainability and that she used only Best Choice Seafood in her restaurants, as did Chef Goetz. Part of the PR package we received was a pamphlet from Monterey Bay Aquarium Seafood Watch listing Best Choice, Good Alternatives and fish to Avoid. Chef Mary Sue asked us to find another fish to love beside salmon. 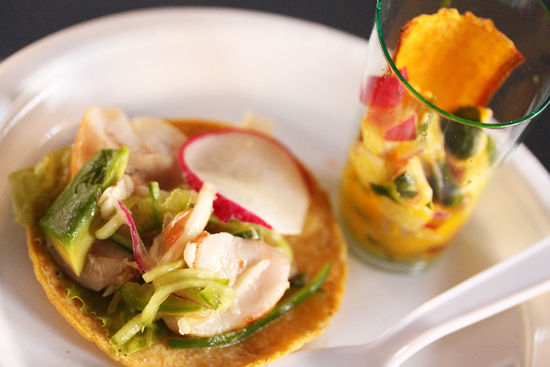 Chef Mary Sue prepared two dishes: a Grilled Fish Taco with Cucumber Citrus Salsa, and a Ceviche with Aji Amarillo Peppers. Little plates were served to everyone in the audience, including the food bloggers who were the judges. I had to shoot the little plate as it was sitting on my lap. Very awkward. There was a camera man with a huge camera on his shoulder filming everything. After we tasted our dishes, the announcer asked us to speak into the microphone and tell our name, where we were from, the name of our food blog, and what we liked about the Taco and Ceviche. I said I liked the orange pepper in the ceviche. 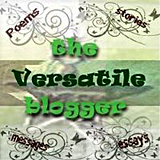 It really was marvelous. The Aji Amarillo peppers left a warm tingling sensation in my mouth that was so interesting and unique. The first photo at the top of this post is the full dish as it is served in the restaurant, with plantain chips and pickled onions. 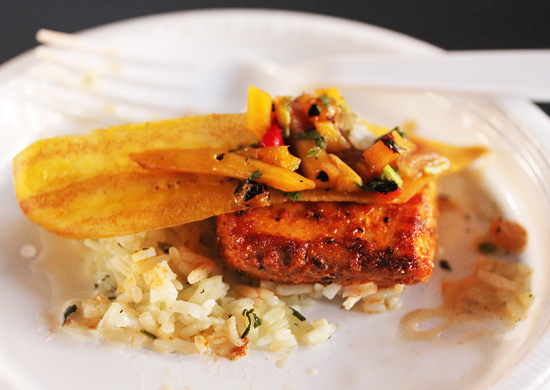 Next Chef Goetz prepared his Chili Lime Rubbed Hawaiian Mahi Mahi with Ginger Jasmine Rice and Roasted Tropical Fruit Chutney. We got our little sample plates and, while being filmed, were asked what we liked about it. I said I liked the Chili Lime rub on the fish. But my taste buds were still singing about the Aji Amarillo peppers, which left this dish pale in comparison. and Rachael of La Fuji Mama. We had one last task, which was the final vote for which chefs’ dishes we liked the best. We judges were asked to raise our hands as each name was called and I raised my hand for Chef Mary Sue Milliken. 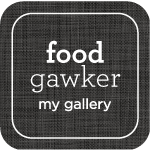 She won the Food Blogger vote hands down. Next the audience was asked to cheer for their favorite and the noise meter would determine their winner. Chef Goetz won the popular vote by a landslide. He must have had customers in the audience. The chefs met in the middle and had a handshake. Very civilized. Each chef prepared their dish the way it is served in the restaurant so we could photograph it. 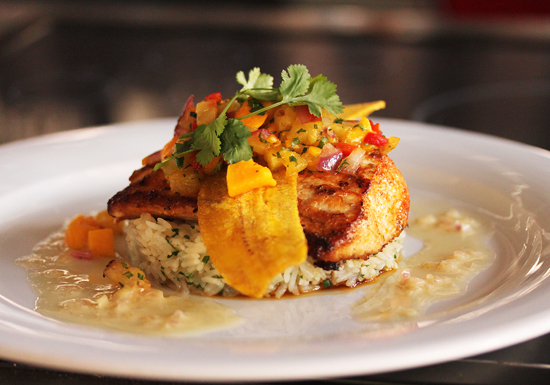 This is Chef Goetz’ Chili Lime Rubbed Hawaiian Mahi Mahi with Ginger Jasmine Rice and Roasted Tropical Fruit Chutney. It had a pretty presentation. This is the Grilled Fish Tacos with Cucumber Citrus Salsa restaurant presentation plate. We received the recipes for Chef Goetz’ Mahi Mahi and Chef Mary Sue’s Tacos, which are at the end of this post. We did not receive the recipe for the Aji Amarillo Ceviche; however, I did write down the ingredients as Chef Mary Sue was making it. 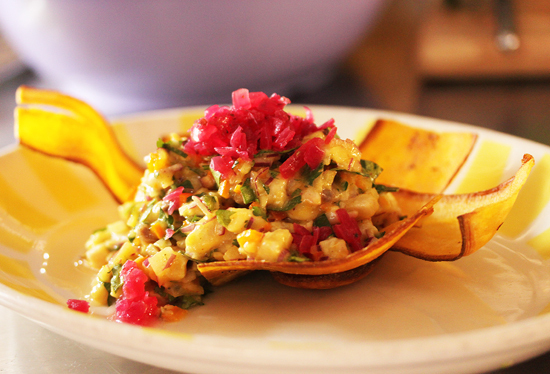 The Ceviche contained red snapper, grated ginger, Aji Amarillo peppers, red onion, jalapeno, lime juice and cilantro, and was garnished with plantain chips and pickled onions. I am planning on making this in the future and I will be able to give you the ingredient amounts. It was amazing! I bought the Aji Amarillo Peppers, which are from Peru, at El Gaucho Latino Market in Redondo Beach, so I am ready to go. During her presentation, Chef Mary Sue told us that she was going to be in Glendale the next weekend challenging Piero Topputo of Trattoria Amici. Chef Goetz said he would be happy to go along and help her. Chef Mary Sue looked at the audience, winked and said, “I don’t need your help, believe me.” All is fair in love and culinary war, I guess. 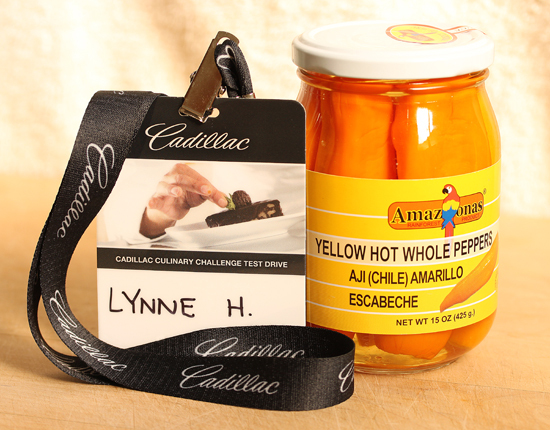 The Cadillac Culinary Challenge will be in Atlanta, GA on November 5-6, 2011 with Marcus Samuelsson of Red Rooster Harlem vs. Kenneth Bills of Flemings Steak House. Then on to Ft. Lauderdale, FL November 12-13, 2011 with Marcus Samuelsson vs. Oliver Saucy of Cafe Maxx. Go to Cadillac Challenge for the details. 1. Warm tortillas by dipping in water and shaking off excess. Toast, in batches, in nonstick pan over moderate heat, about 30 seconds to 1 minute per side. Wrap in towel to keep warm. 2. Preheat a medium-hot grill, broiler oven, or pan on stovetop over medium-high heat. Drizzle fish with olive oil, season with salt and pepper, and cook until barely done, 2 to 5 minutes per side, depending on thickness. Remove fish from the grill or pan, let cool slightly, and pull apart into large flakes. 3. Place tortillas on work surface. Line each with a piece of lettuce and top with chunks of fish. Top each with generous spoonful of cucumber citrus salsa and a drizzle of olive oil. 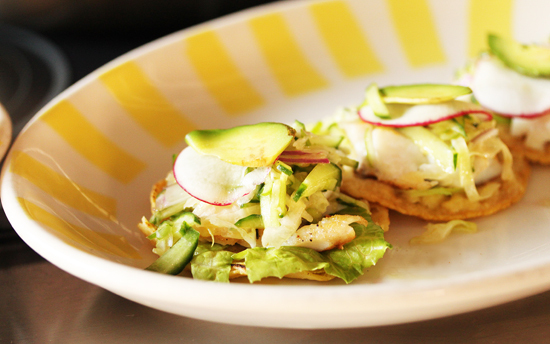 Serve with avocado, radish and lime wedges. 1. Marinate Mahi Mahi with all ingredients for at least 2 hours. Grill both sides to a golden brown, approximately 4-5 minutes each side. 1. Rub all fruit and vegetables with olive oil and grill both sides. When done, dice into fine pieces and mix together with cilantro, vinegar, syrup, salt and pepper. Keep at room temperature. 1. Sauté onion, garlic and ginger in melted butter. Add rice and season with salt and pepper. Add rice and season with salt and pepper. Add water and cook, covered, without stirring until all water is gone or until rice is cooked. Add cilantro. 1. In saucepan, reduce wine with shallot, garlic, and lemongrass until nearly dry. Remove from fire and add butter (a little at a time). When done, season with lemon juice and salt and pepper. Arrange Mahi Mahi atop jasmine rice. Top fish with 1 tablespoon Tropical Fruit chutney and a dollop of Lemongrass-Gewurztraminer Butter Sauce. How Fun !!! I am so living vicariously through you. These look amazing and I will need to make them once it warms up again. Oh, how much I missed seafood while I was in Serbia! I had some great trout in a wonderful restaurant on the river, but it was not enough to quench my thirst for sea creatures! All the dishes look amazing and I know you had tons of fun! Next post: The Halloween Pumpkin That Won the Prize!